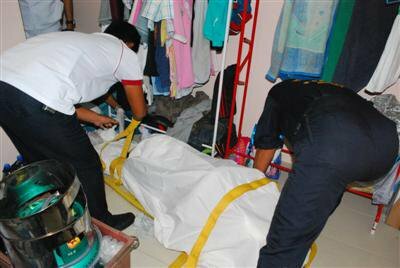 PHUKET: A depressed theater worker took his life by hanging in a rented room in Phuket last night, leaving behind a farewell note and money for his parents. Phuket City Police were called to a rented room on Soi Samkong 1, Rassada, just before dusk. Arriving at the scene they found the body of Naphong “Ton” Boonnuam suspended by the neck from a loincloth tied to metal security bar in a window of the single-story dwelling. The 32-year-old was a native of Bangkok. Nearby was a long farewell note and some photos. The note left instructions that money he left behind should be sent to his parents. Mr Naphong wrote in the letter that he was depressed, said police. However, it was not revealed why Mr Naphong was feeling that way. Mr Naphong’s body was discovered by one of his two roommates. “Naphong was a friend of my brother. We all lived together in this room. I came home from work and found him, so I called the police,” said one of the roommates. “Mr Naphong worked for show theater in Phuket. We never had any problems, but I noticed he was very quiet over the past few days. I went to work as usual this morning, but he didn’t. He was home alone because my brother is in another province on a business trip. When I came home I was shocked to find him dead,” he added. After collecting evidence, police consigned the body of the late Mr Naphong to Kusoldharm Foundation rescue workers. The body was sent to Vachira Phuket Hospital for further examination and storage until claimed by relatives.